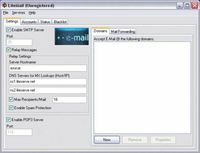 CC Mail Server, an easy to use email server software and web mail server software, allows you to send and receive emails across the Internet and has supports for client email applications such as Outlook, Eudora etc and web mail. Web mail function is based on ASP and IIS. User-friendly interface makes CMailServer very easy to configure and maintain. With this application, small to medium sized companies will handle their email management requirements with ease and peace of mind. 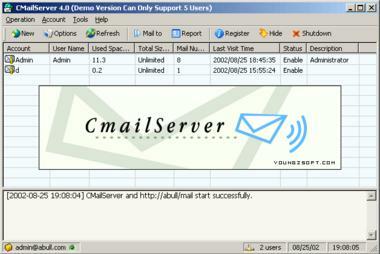 Below are the main features of CMailServer: 1)Can be run in LAN, Intranet and Internet. 2)Works great with popular client E-mail applications. E.g.Outlook and Eudora. 3)Supports Hotmail-like Web mail. 4)Can send and receive mails via Internet. 5)Support of mailbox registration, password change, and personal data modification via Web browser. 6)Enables administrator to create, delete, disable users' mailbox and set the mailbox size. 7)Supports administrator sending mail to multiple users at one time. 8)Generates User Mailbox Info Report in HTML and INI formats. 9)Can run as NT service. 10)Provides ESMTP authorization. 11)Supports mail group. 12)Supports multiple domain names.